A funny card for your favourite nerd or geek. Send it for a birthday, anniversary, or just because. 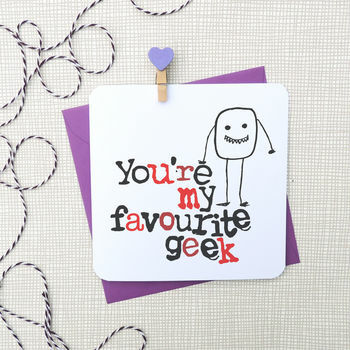 The card features the words 'you're my favourite geek/nerd' in messy text. A geeky monster is stood to the side. Please pick which option, nerd or geek, you require from the drop down box to the right. If you want us to send this card direct to the recipent in the purple envelope we can do that. Simply select the relevent option from the drop down box and make sure you add the recipent's name and address when you check out. The card is made from excellent quality 330gsm white satin card with funky curved edges.